The face of a future assassin. 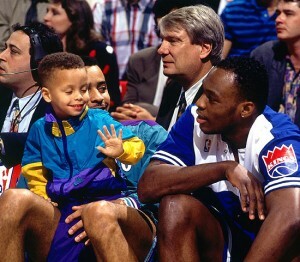 Don’t let the baby face fool you — Stephen Curry is a mean, mean man. 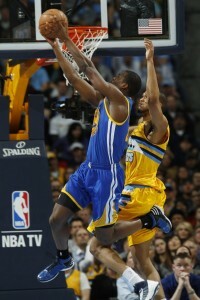 What he did to the Denver Nuggets last night was downright cruel. Scoring 22 points in less than six minutes of the third quarter — that’s the basketball equivalent of pulling someone’s heart out and showing it to them while it’s still beating. Didn’t Steph’s mama teach him that it’s not nice to treat people that way? Even if those people are your opponents in an NBA playoff game. As he rained in one shot after another — ridiculous threes, floaters, runners, and what appeared to be a 12-foot, left-handed underhand scoop off the glass — all I could do was sit there and marvel at the discourtesy he was showing for his fellow professionals. All the fight went out of the Nuggets after that. The Dubs lead the series 3–1 now, and stand on the brink of an unlikely series win (though nothing, of course, is guaranteed in this crazy world of ours). Use whatever word you like — I just hope he didn’t learn his lesson and doesn’t anytime soon. Today is a good day to be a Warriors fan — as good a day as we’ve had in six years, at least. Against all odds, our team stepped up and beat the Nuggets last night, as I sipped whiskey at Sidelines in Arcata, drumming my fingers on the bar and occasionally leaping up from my seat and making a spectacle of myself. The Nuggets didn’t seem to know what hit them, and frankly I felt a little bit that way myself this morning. We Warriors fans are not well-equipped to handle success, especially when it comes in so surprising a fashion. (The whiskey may have had something to do with it too.) I’m not complaining, mind you; the day just keeps getting better and better, and I’d love to have three more just like it in the next week or so. I haven’t written much this year about the Warriors, who are doing just fine anyway, thank you very much. Or at least they have been up to this point. There was a bit of a tragedy on Sunday, when the Dubs not only lost a close one to the Denver Nuggets in their first playoff game since 2007, but lost power forward David Lee to a torn hip flexor. I am having a hard time finding a positive way to spin this. Lee, an eight-year veteran and two-time All-Star, was playing in the very first playoff game of his life when he decided to challenge shot-blocker Javale McGee at the rim. It was a smart play going into McGee’s body to neutralize his jumping ability; but the results were…ugh, well, let’s not discuss it anymore. Now my boys have to face a strong and deep Denver team without their best big man, not an appetizing prospect by any stretch of the imagination. But you never know. Steph Curry and Klay Thompson could go crazy. Carl Landry and Andrew Bogut could step up into the void. Jarrett Jack could bust out his Boom Dizzle imitation. Harrison Barnes and Draymond Green could forget they’re rookies and do something special. 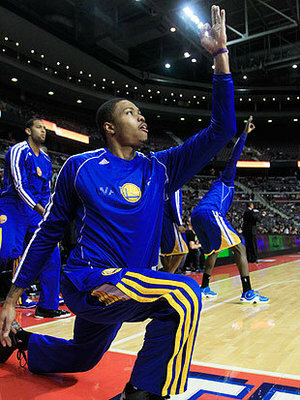 Hell, Kent Bazemore could turn out to be the second coming of Sleepy Floyd. Don’t look at me that way. It could happen. I am pleased to report that as of this week I have officially fallen in love with David Bowie’s new album. It took a little while — the compositions on The Next Day are not, for the most part, immediate grabbers. And the production style is very dense and overloaded, making a complete listening of the album somewhat exhausting; it is best heard four or five songs at a time, say in the car while driving back and forth between Eureka and Arcata. But just when I started to fear The Next Day was going to come and go without making much of an imprint on my consciousness, I found the songs popping into my head at random times and places. “(You Will) Set The World on Fire,” “Dirty Boys,” “Valentine’s Day,” “You Feel So Lonely You Could Die”: great tunes all. If I do have a criticism, it’s the way the album’s assembled: The sequencing seems pretty haphazard and it could use a little trimming. 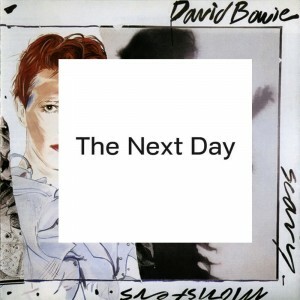 None of the songs are terrible, but 45–50 minutes are optimum for any album, especially one this information-rich. Fortunately, modern technology makes it pretty easy to create your own version; here’s the one I’ve been listening to lately. Thanks for nothing, Internet — you only just told me that Kevin Ayers died, more than a month after the fact. What do I keep you around for, anyway? Although maybe in a way that’s appropriate; I’m no expert on Ayers’ life and work, but I am under the impression that he was a super-talented guy who could have been a colossal star if he wanted, but just didn’t care to work that hard. He co-founded Soft Machine back in the late 60s, but when they started to get big and it became sort of a job, he took off for a solo career. 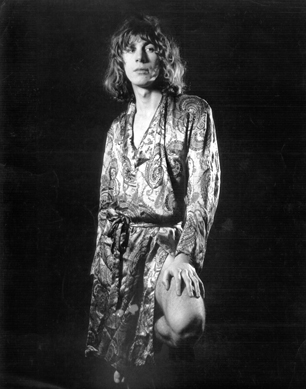 His orbit intersected with those of people like Syd Barrett, Brian Eno, and, famously, John Cale — according to rock legend, the “bugger in the short sleeves” who “fucked my wife” in Cale’s song “Guts” was none other than Kevin Ayers — but he never quite became a household name. Even so, he managed to make quite a few albums; I highly recommend The Confessions of Dr. Dream and Other Stories if you’re looking for a place to start. But even more than Ayers’ music, I am interested in his life, because he seems to have been a true hedonist. As one with tendencies in that direction, I have always wondered how things might work out for someone with the means and the inclination to pursue full-bore hedonism as a way of life. Powered by WordPress v 5.1.1. Page in 0.137 seconds.